The Supply Chain Handbook brings together a team of 23 experts from management, engineering, technology, consulting, and academic backgrounds. These experts share proven operations methodologies, evaluate technologies, and offer practical how-to instruction on topics impacting todays supply chains. Each topic is explored in depth to provide readers with greater understanding and the ability to put the ideas presented into action. Innovative concepts and state-of-the-art technologies such as leaning the supply chain, logistics outsourcing, RFID, and supply chain execution software are explored in-depth helping you evaluate these solutions for your supply chain. 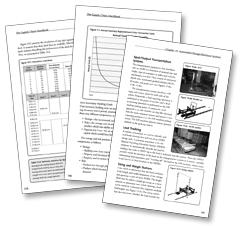 The Supply Chain Handbook also covers fundamental topics such as warehousing operations, space layout and planning, distribution network planning and design, transportation, manufacturing strategies, material handling systems and integration, inventory management and more. The Supply Chain Handbook brings together practical information and proven strategies for supply chain success. Paul S. Bender, P.S. Bender & Co.
Kenneth Ackerman, K.B. Ackerman Co.
James K. Alred and Stephen L. Parsley, Daifuku America Corp.
Allan Fraser and Douglas Furbush, Teradyne, Inc. 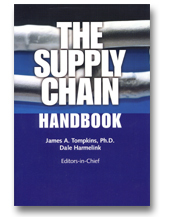 The Supply Chain Handbook was written by a team of 23 supply chain experts and edited by Dr. James A. Tompkins and Dale Harmelink of the supply chain consulting and integration firm Tompkins Associates. The Supply Chain Handbook is guaranteed. If you are not 100% satisfied, you may return it within 30 days for a full refund.